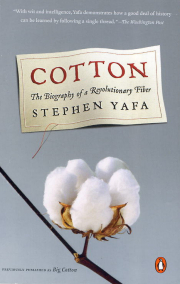 COTTON, THE BIOGRAPHY OF A REVOLUTIONARY FIBER, Stephen Yafa (a novelist, playwright, video producer, award-winning screenwriter). What do lipstick, gunpowder, crackers, and paper money have in common? In a word, cotton - at any given time practically everyone on earth is wearing or using or eating something made with it. From its domestication some 5,500 years ago to its vast control today over our government policies, this is the incredible story of the crop that spawned the Industrial Revolution, sparked the American Civil war, and made at least one bug - the boll weevil - world famous. Circling, the globe and cutting across centuries, "Cotton" is the epic tale of the humble fiber that - again and again - reinvented our world. Published by Penguin Book /History, paperbound, 408 p.
Contents: Spin in All Directions, Star Turns, The Barber from Preston, Revolutionary Fiber, Camelot onthe Merrimack, Looming Conflicts, Souther Exposure, Changing Fortunes, Two-Horse Power, Boll Weevil Blues, The Shirt on Your Back, Fields of Conflict, Afterword, Index. IN SHEEP'S CLOTHING, A HANDSPINNER'S GUIDE TO WOOL, Nola and Jane Fournier. Everything from baby-soft Merino and fluffy Cormo, to silky Lincoln and sturdy Karakul - the full range of nature's miracle fiber is represented. Hundred of breeds of sheep are described, with special attention to their fleeced characteristics, methods of preparation and spinning, and best end use. 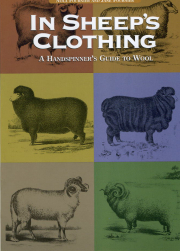 Published by Interweave Press, paperbound, 228 p.
Contents: Getting Started, About Wool, Fine Wool, Longwool and Crossbred Wools, Down-Type Wools, Other Wools, Black and Colored Wools, Selecting, Sorting, and Storing Fleece, Blending Wool, Terms and Techniques. 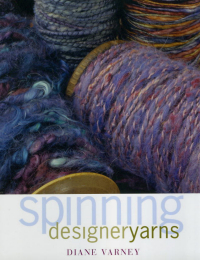 SPINNING DESIGNER YARNS, Diane Varney. Learn new methods for applying dye to fibers, predict how novelty yarns will look in finished fabrics, blend fibers for color and texture effects, and spin singles and plied yarns in exciting ways. Published by Interweave Press, paperbound, 100 p. * bestseller.